The palette contains 14 shades - a mixture of mattes and shimmers all housed in a heavy cardboard, velvet-coated palette with a double ended brush. I'm not crazy about the velvet as it gathers dust and dirt and that was one of the reasons I gave up on the original Naked palette long before I should have but it is what it is and it's not a deal-breaker. The shade selection is pretty Autumnal so releasing it in July may not have been the best idea (just like the Too Faced Sweet Peach collection screams summer but was released in late Winter/early Spring). 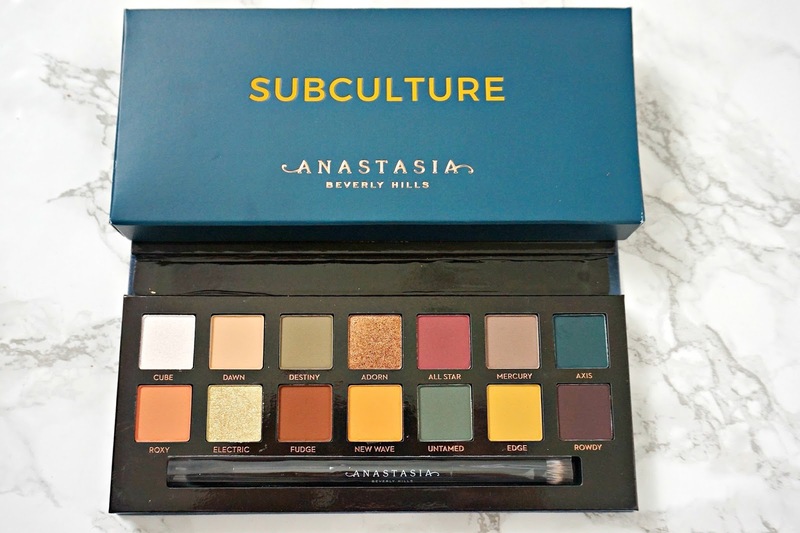 I can see why not everybody will like the shade selection as greens and yellows are not the easiest shades to wear but I believe that this palette is aimed at those who are experienced in eye makeup and definitely not for beginners. The swatches in the photo above are completely unedited because I wanted to give a true reflection of what the shades actually look like. 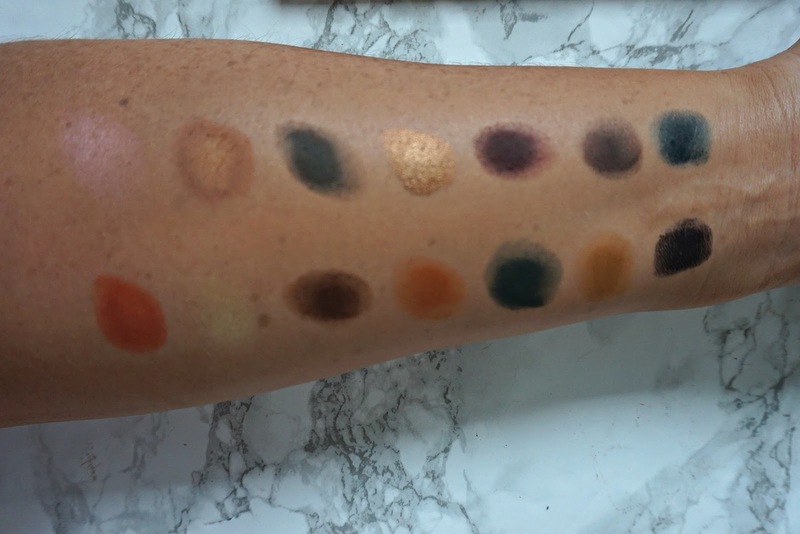 As you can see, most of the shadows are extremely pigmented - they quite remind me of Natasha Denona shadows in terms of pigmentation but not in terms of texture. These shadows require the lightest touch - I cannot fathom why there are videos of people digging their brushes into them I wouldn't do that to any of my eyeshadows. There is no fear of hitting pan on first use if you respect the product and use it correctly. Yes, some of the shadows are powdery with some fallout in the pan but, in my experience, not on the face - as long as you gently tap your brush into the product and tap off any excess. The texture of the shadows is a little more powdery than those in the Mario palette but the difference isn't vast but I assume people didn't want to hate on Mario's palette because he is worshiped in the beauty world! The metallic/shimmer shades are the ones most difficult to work with - Cube and Electric, in particular - it's difficult to build up pigmentation, which is a real shame as Electric is one of the shades that I was most excited about. Adorn is also a shimmer but is pretty pigmented once applied with your finger rather than a brush and it very much reminds me of some of the shades in the Mario palette. The mattes are uber-pigmented and therein lies the problem for a lot of people - you literally need the tiniest amount of product - far less than with most other shadows you will have used in the past, then gently place it on the lid before blending. You must remember that most of the negative reviews we've seen on youtube are from people using the palette for the first time - that is when you make your mistakes, when you use it the second time and each subsequent time thereafter, you know to go gentle to avoid the same mistakes. Also, most of the looks that I've seen created on youtube were using the darkest shades, which can look terrifying to those of us who are not MUAs but it is perfectly possible to create very wearable, daytime-appropriate looks with this palette. I have not had a problem with oxidisation, however I always, always, always prime my eyes so maybe that is the reason. I think the reason that some shadows almost blended together into one colour on some people is due to too much product being used - this is not a problem that I have had. Overall, I am very happy to have this palette in my collection. Do I love it more than the Mario or Modern Renaissance palettes? No. Is it in the top 5 palettes in my collection? No, but it is one that I will reach for a lot through Autumn. Is it worth the hate? Absolutely not, in my opinion. Do you own this palette? If so, what has your experience been and if not, are you tempted to buy it? I'd love to hear your thoughts!